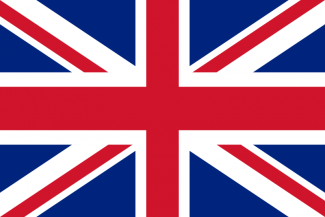 The United Kingdom, in 1836, begins in a position of utmost envy. It is the foremost industrial, commercial and military power in the world. It is unrivaled at sea, and can easily maintain this position throughout the game. At the beginning of the game, the UK has a myriad of objectives, which, for any other power, would be daunting. The sprawling British Empire provides it with ample amounts of resources and manpower. 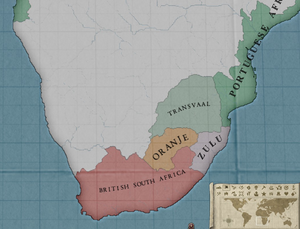 The first objective should be to secure and expand these colonial borders. The UK has an enormous capability to fight military conflicts with both its large starting army and navy. The empire is slowed by one major diplomatic concern, that of foreign wars of containment. These wars will be provoked if the UK fights too many wars too quickly. Thus the UK should utilize its Spheres of influence to secure land for future conquests and avoid provoking European intervention. By placing influence points into key nations, like Japan, the UK can intervene and aid these nations should another power attack them. Controlling other nations in this manner also reserves the ability for the UK to seize them at a later date when it feels secure in doing so. Another way to secure a low Infamy, other than slow expansion or sphere use, is to exploit the UK's unique decisions. The UK can make several unique decisions, such as the "Treaty of London (1864)", which enable the UK to reduce its infamy. The London Treaty for example, will give Greece the small unimportant Ionian Isles in return for four less points of infamy. This is half the infamy cost of a colonial concession war that could be used to gain a huge state in Japan, for example. Austria from the minors in these regions can benefit the UK. If Italy is allowed to form in will gain core on Austria and can be used by the UK to provide a land enemy to Austria and give Austria something to worry about on their western border. This case is the same with Germany for both Russia and France who will need to keep large land forces near Germany should it form. As the UK anything that keeps European nations focused on Europe and not on gaining foreign colonies makes the UK's game easier. For the British Empire the benefits of securing India for the empire are huge. The large RGOs and populous provinces of India provide three major benefits for Britain. Firstly the huge amount of cotton and dye that is produced in India enables the UK to build a huge textile industry back in the home isles, and at a low cost because the UK can provide all of the raw materials for itself. Secondly India can provide the UK with abundant soldiers as the population of India is driven out of their RGOs by improved technology and into the British army, which allows for more industrial workers in the home isles. Thirdly the population of India is so great that they can provide a large base of migrants for other colonies such as South Africa and Canada as unemployed POPs move out of India. At the start of the game the Indian minors have two major flaws that the UK can exploit. One is that the Indian nations have far weaker technology than the UK. If the UK attacks in force it can overwhelm the native Indian armies. Panjab, which if the UK attacks quickly and in force while the Panjab has weak tech it can be quickly broken. Additionally, the decision The Empress of India is available, once Great Britain annexed the Capital of Panjab. The second problem facing the Indian minors is that they are almost all within the Sphere of the UK at the start. This allows the UK to intervene should a foreign power attack the minors and allow the UK to slowly remove them from its sphere and annex them. 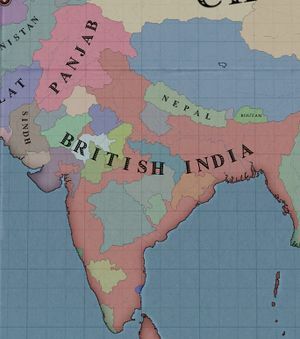 United Kingdom will slowly annex its Indian vassals with the event The Doctrine of Lapse, which is however stopped once the decision The Empress of India is taken. Java and Sumatra is valuable provinces, that one might consider. Venezuela is a good target for expansion. It becomes one of the largest producers of oil in the world. Economics 101: Oil = Money. Venezuela lacks protection from any major power, and has a land border with British Guyana. It is vital for the UK to maintain a much larger and more advanced navy than its competitors. The fleet will allow the player to dominate the seas and makes fighting all other countries, even the other Great Powers, much easier. The UK already starts out with many naval technologies unlocked, and with the UK's strong economy, it allows the player to build up a technologically advanced but also large navy. Initially, the greatest rival for the UK will most likely be France, but they are still behind at the beginning of the game. Hannover breaks free. This removes the main foothold on the continent. You should decide whether expansion from here on will be focused on Europe or colonial acquisitions. Taking colonies and destroying uncivilised nations is easier, and the more historical option, but taking European territories will give you more prestige and a higher industrial ranking. Russia, the Ottomans and America. USA, it is a good idea to take them on early. The further along in the game, the stronger America gets. within 30 years its population goes up by millions. They are very weak during the American Civil War (ACW).